Addresses are assigned to each residence as a convenience for visitors and for those making deliveries. In some areas, addresses may also be used for door-to-door postal delivery. Emergency services rely on clear, accurate addressing to ensure efficient response, so house numbers need to be clearly visible from the road. Inaccurate and poorly-displayed house numbers may cause confusion and delays in emergency service response. In the Electoral Areas of the Regional District of Nanaimo, the Ministry of Transportation and Infrastructure is the authority for naming and maintaining roads. 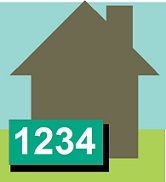 House numbers are assigned by the GIS Department of the RDN. Our RDN address and road records are used by the Province, to maintain the Digital Road Atlas, and by Telus, to verify the accuracy of their address records. Both of these records are used for the 911 emergency dispatch systems. Each residence requires a unique address. Where a property has two or more residences, each residence is assigned a different number. In cases of multiple residences on a property, such as a mobile home park, unit numbers are assigned to a parent address, e.g. #3 - 1234 SOMEWHERE ROAD. In cases where a secondary suite is contained within a house, the secondary suite is assigned a letter suffix to the address of the house, e.g. 456A DOWNTHERE ROAD. A secondary suite that is separate from the house is assigned a unique number if possible. Otherwise, a letter suffix is applied to the house address. Addresses are assigned during the processing of building permit applications and are recorded on the permits.